A few weeks after Abhishek Hazra’s twitter-art/ performance in Delhi, Marina Abramovic performs The Artist is Present at the MOMA. In her decades as a performance artist, Abramovic has used her body as vulnerable space, inviting an audience to attack it, as artwork, as artist’s tools, always pushing the limits. Now she sits, almost motionless, as the audience comes up, one by one, to occupy the chair across from her, and gaze into her face. As the performance continues, shifting shape and acquiring new rules, making new discoveries, over the days, it’s accompanied by a recording frenzy. There are photo galleries of those who sat across from her, many of them captured in tears, their emotions uncontainable even in this most public of public space. There are recordings. There is reportage. This is the way it happens with the most moving art, the most significant moments of our lives: even as we’re witnessing and experiencing, the drive to capture what’s happening sets up a peculiarly 21st century anxiety. In a comfortable office, its walls briefly transformed into gallery space by Hazra’s physics-inspired drawings, the artist is surrounded by a ring of laptops. This is to be livetweeted by us, creating a second layer of performance over his performance art. If it works, perhaps it might do what performance art is also, sometimes, supposed to do—break down the fourth wall, make the audience an integral part of the performance. There’s also the technological aspect: #cloudrumble56 might trend on Twitter, and there’s something appealing about using technology to capture or analyse or experience a performance that’s about the history of science. And there is the irony of trying to use the highly compressed, shorthand language of Twitter—140 characters is your limit—in real time, to tweet about a performance that is, in great measure, also about the breakdown of and the futility of language. 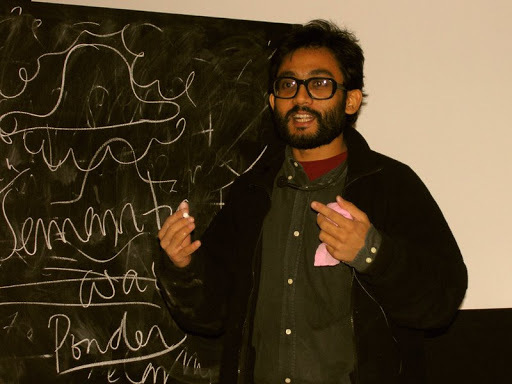 At various points of time, Hazra will offer fragments: of thoughts, of excerpts from the speeches of Saha, of explanations of an ionization chamber, stray phrases, references to caste or local identity–“Sahas are not Boddhis”—in his deliberate dismantling of the story and the success story of one of India’s iconic scientists. Almost two months after the performance, I’m looking for traces of it on the Net. I have been here before, in the early, evangelical years of the world wide web, when it used to be called the “information superhighway”. Roughly two decades ago, our expectations of the web’s memory were naïve, and awed. Everything was archivable; everything could be preserved. Google Cache made this seem inevitable; spycams and easy uploads and Google Maps made everything seem indelible, accessible, infinitely available. As we know now, this is not true. By the mid-1990s, you had ghost sites. Abandoned web pages and Usenet group discussions that no one bothered any longer to visit or access floated in cyberspace like shipwrecked hulks, settling in silence to the bottom of the information ocean. Magazines as great and apparently indestructible as Feed disappeared; caches remain, but as the memory of one generation fades, even caches are less and less often visited. Virtual moss grows over them. Those who were hooked to the lives of their avatars in Second Life and other virtual worlds move on when the sites hiccup or shut down, creating new personas and new avatars, sometimes ransacking their old selves, sometimes abandoning them entirely. There is little new about this process; it’s the way we handle our meatspace lives. #cloudrumble56 is still there on my Twitter feed and still there somewhere in Twitterspace—the counterpoint to the inbuilt ephemerality of Twitter is in the old-world institution of the library. The Library of Congress Archives will save tweets, patiently, as a searchable archive: the babbling mouths of the Internet, preserved for posterity. Until I find my personal cache of #cloudrumble56, what I get are error messages. Hashtag not found. Try a more general search. Try using different words. On my own Twitter feed, I can find my own tweets. But they’re isolated from the herd, drifting in solipsism, and they make little sense without the comments of the others who shared laptop space with me that day. Finding the cache, where everyone’s tweets are stored, except for the two who accidentally typed “clourdrumble56”, creating an opera box for two, a privileged performance space of their own, leads to a surprising, unexpected surge of happiness. The relief of not being on one’s own any more, the only watcher, the sole witness/ participant. If you’ve ever played role-playing games, you’ll know all about the fork in the road, the point where you get multiple choices and can continue as a knight errant or choose to upgrade to seventh-rank ninja warlord, can visit the Baba Yaga’s reinvented techno clubhouse or a Tokyo subway station from the late 1950s. I could now discuss the content of Abhishek Hazra’s performance, which has to do with the life of a scientist who came from a village near Dhaka, a scholarship boy who made his name with his work on the thermal ionization of elements. I could discuss how his performance makes its bow to the conventions of performance art by starting with the body of the artist—clad in layers and layers of football shirts, sweatshirts, T-shirts, which he will cut up with scissors or mutilate or discard as he removes the layers slowly. Or discuss the many ways in which he subverts our expectations and the notions of what constitutes art by deliberately creating and removing layers of meaning, by fracturing language, with his use of headsets and tinned cheese to puncture the usual technological tropes. It’s in keeping with most of his work, which has demonstrated a fascination with the hidden narratives behind science, and which is underpinned by his fairly formidable knowledge of his subject. But that’s not the point of this essay, and there are better critics of Hazra’s art and work than me to turn to in this respect. Tweeting a live performance is exhilarating and distracting at the same time. For those of us in the room, the sense of connection with one another—students, art lovers, the curious—develops before the performance as we chat and reach for chocolate éclairs, set up our laptops on the tables provided, check to see that we have a reasonable view of the artist. When the performance starts, we retreat from one another, absorbed by our keyboards, looking up or communicating only to share hashtags or to make an occasional, rare observation. This is a polite audience, and no one intervenes with their own performances, no one interrupts the artist. Those of us who have developed the ability to touch-type are at an advantage, but it’s interesting to see how most of us, tweeting in effective isolation, reach immediately for description: he’s taking a sweatshirt off, he has the scissors in his hands, he’s shouting, he’s come up to my chair, he’s handing around a pamphlet, we take bites out of the tray of “cheese”, which doesn’t stand for “cheese” at all, we are watching and worried that we might miss something. About twenty minutes into the performance, you can see the wear and tear on the Twitter timeline, as people abandon description: perhaps it’s too fatiguing, perhaps we’re beginning to recognize the futility of describing a performance that, like all performance art, you really need to be immersed in. Perhaps it’s also the frustration inherent in trying to livetweet performance art that’s showing through: the greater your fidelity to capturing the performance, the more attention you pay to structuring your tweets, the less you’re actually witnessing or experiencing the performance. If you could plot the graph of Hazra’s performance on a tweet monitor, it’s the seconds of collective silence, the half-minute of nothing, where something has happened in the space of that room, where we’re most deeply engaged—too engaged to tweet. On some of the Twitter clients I use, #cloudrumble56 is still alive, still accessible. Of the people in the audience that day, some were neophytes to Twitter—entering its gargantuan talk-chamber with no preparation at all. (This encourages solipsism: if you don’t know that you can follow people on Twitter, and no one is following you, you can have conversations with yourself all day if you so choose.) Some have set up separate accounts for this Twitter performance; I haven’t, and as I tweet, I receive puzzled Direct Messages looking for Abhishek Hazra’s Twitter performance—the assumption is that #cloudrumble56 is the art event itself, not the twitter feed about the art event. I share this with the person sitting next to me, and we both admit that we had been expecting Twitter performance art—we hadn’t realized that we were the Twitter performance art. It comes to me, weeks later, that Twitter is the perfect client for performance art. Every other way of preserving a performance online—videotaping it, or writing about it, as I’m doing now—offers the reassurance of permanence. But as much as writers and photographers will try to capture Abramovic’s performance in New York, as vivid as your descriptions might be of a radical performance piece at Devi in Delhi or in the theatre district in Tokyo, the truth is that what passes between audience and artist, performer and witness, or co-performer, is private. It seems right that #cloudrumble56 will disperse, as the ions in an ionization chamber will after the experiment, or as we do after the performance. It seems right that its Twitter footprint will fade, shoved down the list of trending topics as each day’s cargo of news and opinion and jokes (and art) piles up. There is no such thing as a perfect cache, whether you’re discussing memory or art. There is no such thing as the perfect capture, or the perfect evocation of an art event; what livetweeting returns you to, inexorably, is the performance itself. I’m looking at the #cloudrumble56 tweets, at these fragments of testimony, reaction, appreciation, puzzlement, engagement, boredom. The collective tweets, even the ones by the two who had the wrong hashtag, are a touching way of trying to capture what lies beyond language with the blunt tools of language, and you can also see emotion, sudden understanding, crosslinks to other web pages that reference Saha or performance art or science or electrons. Caught in this fragile web is a half-conveyed, imperfectly expressed experience; it’s like walking into a reader’s mind as s/he is reading and drawing up a ringside seat. This is the way one contemporary school of criticism is headed: inside the mind of the reader, or the viewer at a performance, inside the thoughts and experiences of the user. It makes art of all kinds, not just performance art, something that is not passive, not done to you—but something that is created and transformed by you and what perceptions you choose to bring to the table. There is one last thing left to do. If I do it, there’ll be no repercussions: the promise of the Internet is that there is a backup, somewhere, a cache, however hidden or inaccessible, some institution that, like the Library of Congress, will offer the greatest luxury we could have as humans—the permanence of memory. I have my notes and my memories, and I won’t need the #cloudrumble56 cache any more—it’s about as much use as an old cinema ticket. But my finger hesitates, and finally comes down on No. Something in me really wants, like those who take pictures of the Abramovic performance, to believe in the possibility of forever.